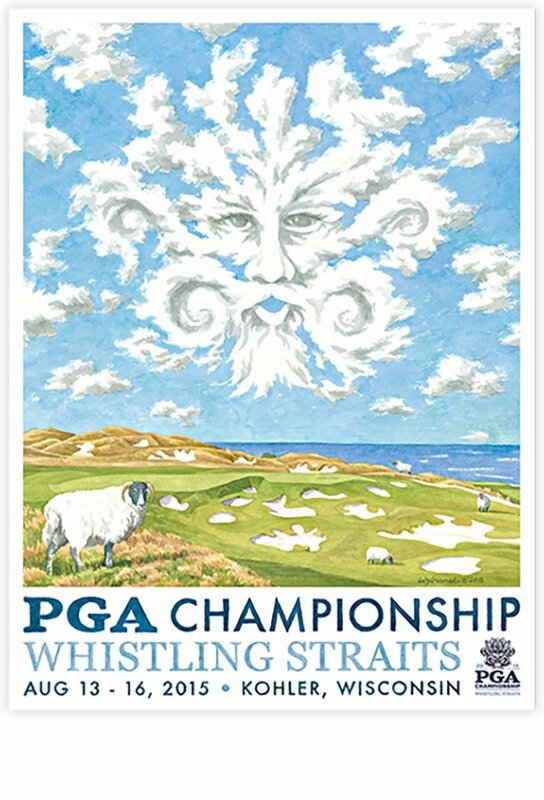 This years PGA poster for Whistling Straits in Kohler, Wisconsin features the famous Scottish blackface sheep, infamous Pete Dye bunkering and a wonderful interpretation of the resorts face logo. The original poster for Whistling Straits has sold out. We have created the “Classic Series”, a digital print on enhanced Matte paper with increased clarity and color saturation and signed by Lee. Here is the 2015 PGA Championship poster for Whistling Straits in Kohler, Wisconsin. This years poster features the famous Scottish blackface sheep, infamous Pete Dye bunkering and a wonderful interpretation of the resort’s face logo.